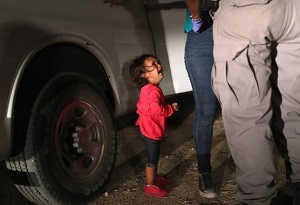 Over the past 24 hours, everyone from the Pope to Fox TV producers to foreign leaders like U.K. Prime Minister Theresa May to top corporate CEOs like Apple’s Tim Cook to U.S. airlines (who learned they had unwittingly transported snatched children hundreds of miles away from their parents) spoke out in condemnation of President Donald Trump’s inhumane policy to forcibly remove children and toddlers and babies as young as three months old from their immigrant parents attempting to enter the United States at our southern border. In many of these cases, the parents were attempting to pursue asylum applications after fleeing deadly gang violence in their central American country. This entry was posted on Thursday, June 21st, 2018 at 10:34 am and is filed under Immediately available to public, Phil's Favorites. You can leave a response, or trackback from your own site.